A second solar plant, to be built in the next three years, will complete the university’s transition to clean power and further shrink campus greenhouse gas emissions. A new solar generating plant – Stanford’s second – will enable the university to use 100 percent renewable electricity in three years, more than two decades ahead of California’s goal of a carbon-free grid by 2045. Completing the university’s transition to clean power, Stanford finalized an agreement to collaborate with Recurrent Energy on an 88-megawatt solar photovoltaic plant to be constructed in central California, near Lemoore. The plant is scheduled to go online in late 2021. 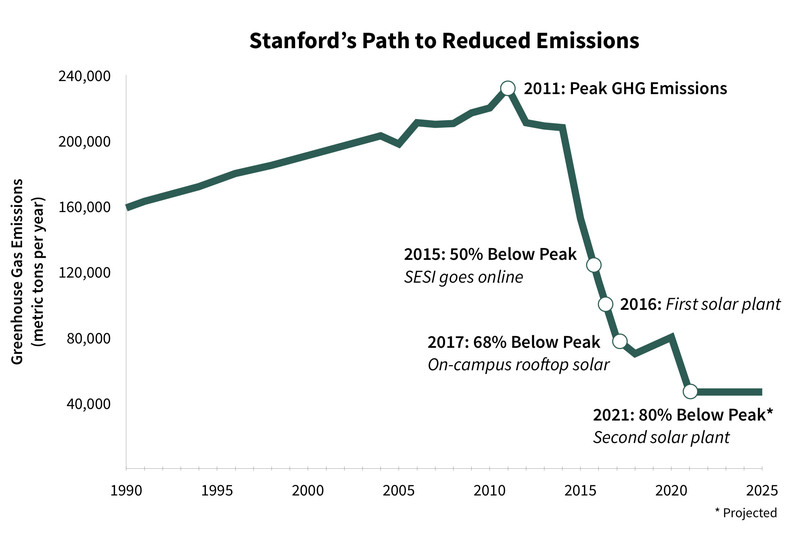 Because of advances from the cutting-edge Stanford Energy System Innovations (SESI), Stanford’s current greenhouse gas emissions already are down by 66 percent from peak levels. The new solar plant, to be known as Stanford Solar Generating Station #2, is projected to reduce GHG emissions even further, to 80 percent below peak levels – four years ahead of the renewable energy goal established in the university’s long-range planning process. The new station will augment the 67-megawatt Stanford Solar Generating Station #1 in Rosamond, California, which came online in 2016, and 5 megawatts of on-campus rooftop solar power, which came online in 2017. 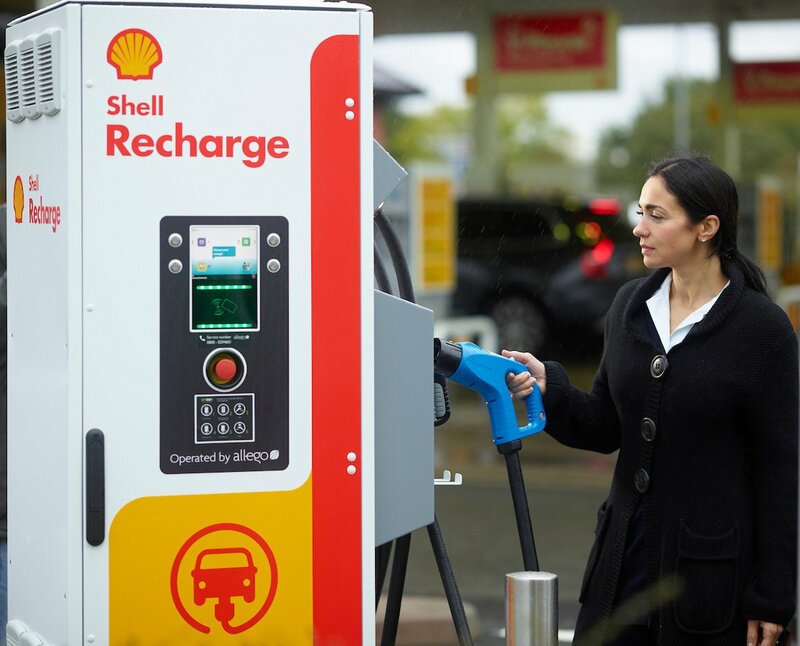 Together, the three installations will produce enough clean renewable electricity each year to equal the university’s annual electricity consumption. To increase energy efficiency and use innovative, clean and renewable energy on campus, Stanford initiated a plan in 2008-09 that includes high-efficiency standards for new buildings, continued efficiency improvements for existing buildings and SESI, an advanced energy-management system with thermal energy storage invented by the university to heat and cool campus buildings. It has updated more than 155 buildings on campus and transformed the energy supply from one based on fossil fuels to an electrically powered heat recovery system. A smaller SESI installation will provide energy for Stanford’s new Redwood City campus, scheduled to open in 2019, giving it a small carbon footprint and path to becoming carbon-free. Stanford achieved a 50 percent reduction in its greenhouse gas emissions in 2015, when the SESI electricity-powered heating and cooling plant replaced an aging, gas-fired cogeneration plant that had served the university since 1987. When Stanford’s first solar plant went online in 2016, the university increased its clean electricity portfolio to 65 percent, up from the state minimum of 27 percent, and has since further reduced university greenhouse gas emissions to 66 percent below peak levels. The university’s long-range plan set a goal of an 80 percent reduction in total campus GHG emissions by 2025. But the transformation of its electricity supply to entirely clean renewable power by 2021 means Stanford will reach its goal four years ahead of schedule and decades ahead of statewide requirements. California enacted legislation earlier this year that requires electricity to be 100 percent carbon-free by 2045. The campus will not be wired directly to the remote installations. Essentially, they will inject clean electricity into the state’s power grid, and Stanford will be able to withdraw an amount equivalent to their production from that grid. By pursuing direct, long-lasting changes to its infrastructure, Stanford avoided the need for temporary measures, such as purchasing renewable energy and carbon offsets, which give credit for renewable resources even if the power comes from other sources. As it continues to reduce GHG emissions, the university is studying additional innovations, including a new lake water heat-exchange system that will provide additional clean heat supply through SESI, converting the remaining outlying campus buildings that currently use natural gas for heating to the SESI clean hot water supply system, and completing conversion of the Marguerite, Stanford’s free community shuttle bus fleet, to electricity. These additional changes would move Stanford GHG reduction to 90 percent when implemented. The remaining 10 percent of GHG emissions comes from a number of small laboratories and building processes. Stanford will inventory them in 2019 in order to develop plans for replacing them with carbon-free alternatives. “Stanford’s deliberate and comprehensive approach to reducing greenhouse gas emissions dovetails with the interdisciplinary research and teaching on campus and our commitment to being a good neighbor and citizen,” said Robert Reidy, vice president for land, buildings and real estate. As part of the university’s new long-range plan, a Sustainability Design Team will explore these and other innovations for a carbon-free Stanford. Over the years, the academic programs and initiatives in sustainability have achieved remarkable breadth, contributing to Stanford’s international reputation for solving major environmental and energy-related challenges. Today, hundreds of laboratories, research centers and student organizations at Stanford work to solve the most urgent problems facing humanity – from food security and clean water to global warming and clean energy. About 225 faculty and staff are engaged in energy-related research across the university, including at the Precourt Institute for Energy, the Woods Institute for the Environment and the TomKat Center for Sustainable Energy. The Jerry Yang & Akiko Yamazaki Environment and Energy Building was built in 2008 to facilitate interdisciplinary collaboration. Accomplishing sustainability goals will require continued campus-wide participation. Stanford’s My Cardinal Green program provides customized recommendations to participating members of the campus community that are relevant to their lifestyles and offers financial and other incentives.